Stefan Viljoen is proud to present his deeper & darker alter ego “The Beat Prophet”, an alias used to express all his deeper & darker Tech,Techno & Progressive influenced creations. 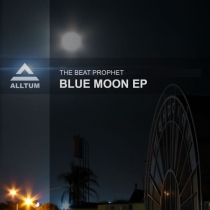 The Blue moon EP is a combination of deep, moody progressive house & dark minimalistic Tech. The title track Blue Moon with its groove bassline & progressive nature sets the mood for the 2nd harder ,chunky Deep Tech track “False Lie”.